BULAMBULI – The Prime Minister Dr. Ruhakana Rugunda on Tuesday January 23, officially launched Shs 32B Bulambuli resettlement project for the Bududa mudslide victims. The first phase of the project comprising 101 housing units will see 7200 people resettled from high risky areas giving priority to Bududa district. According to office of the prime minister ( OPM), the project includes a two bed roomed house with a sitting room, two acres of land for each affected family for Agriculture and piped water. The project that kicked off in November last year is aimed at resettling 900 households and is part of the 10-year government resettlement plan. According to the Uganda peoples’ Defense Force and Uganda Police Force Engineering Brigades, 30% of the project has been completed and they are committed to completing the rest of the work in time. 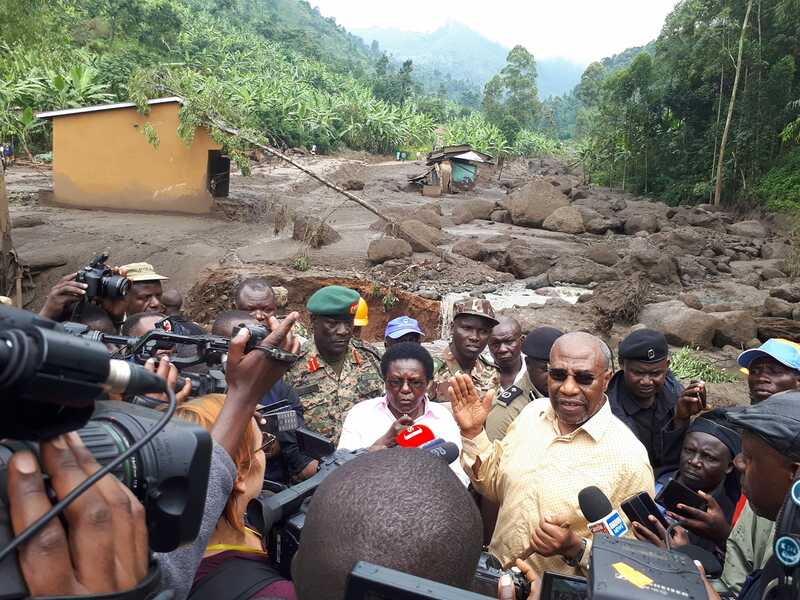 Launching the project in Bulambuli district on Wednesday afternoon, Dr. Ruhakana Rugunda, said government wants to expeditiously relocate the Bududa Mudslide victims from disaster prone areas. He said they will use the project as a model for other resettlement projects, which will see 100,000 people resettled across the country. He said students and pupils who will be relocated will be placed in nearby schools, adding that government will provide their school dues and requirements for the first two years. Dr. Rugunda blamed the delayed resettlement of the mudslide victims on squabbles among concerned officials. Hilary Onek, the Disaster Preparedness Minister said the first phase of the project is expected to be completed by March this year. Onek said the World Food Program (WFP) will settle in Bulambuli to provide food to the resettled people for between 3 to 6 months. He also promised that the Local Government Ministry will organise village council elections since there is need of administrative units in the area. Musa Ecweru, the Disaster State Ministers commended the UPDF and Police engineering Brigades for the work done so far. He blasted journalists for reporting negatively about the Bulambuli resettlement project. Rose Mutonyi, the Bubulo West MP expressed fears about the time for completing the project, saying her voters in Kaato and Buweswa Sub counties in Manafwa district are still living in classrooms since the disaster befell them early in 2018. Vincent Waboya, the Budadiri East MP cautioned government against leaving the affected people behind during the resettlement process, saying the victims should be given first priority.